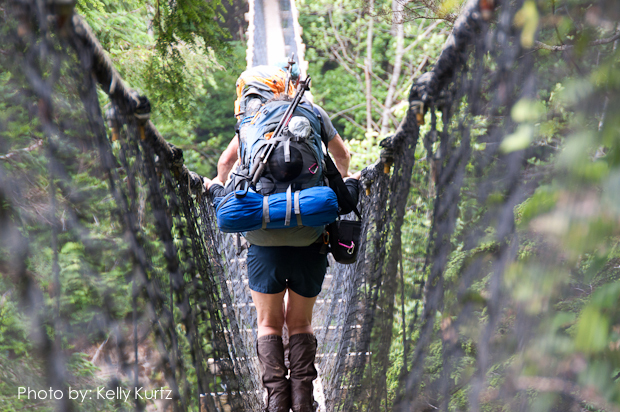 Sea to Sky has introduced hikers to the West Coast Trail for 30 years. Our years of experience will insure that your visit will include all those special places unknown to the average hiker. 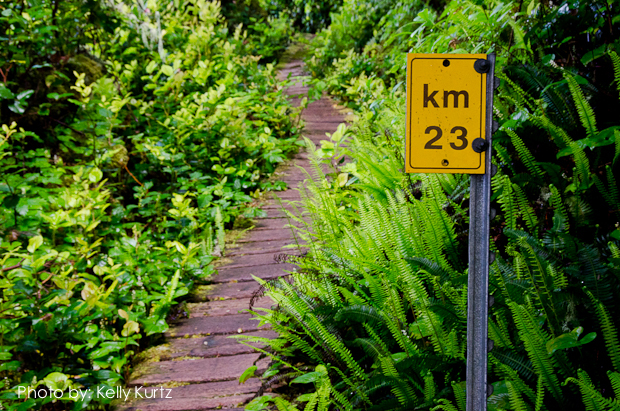 The West Coast Trail is a challenging coastal trek. Known also as the “Graveyard of the Pacific“, it is rich in human history, wildlife, and natural rugged beauty, and is considered one of the world’s top ten hikes. Once you start hiking, you will quickly come to understand why hikers travel from all over the world to undertake the West Coast Trail. 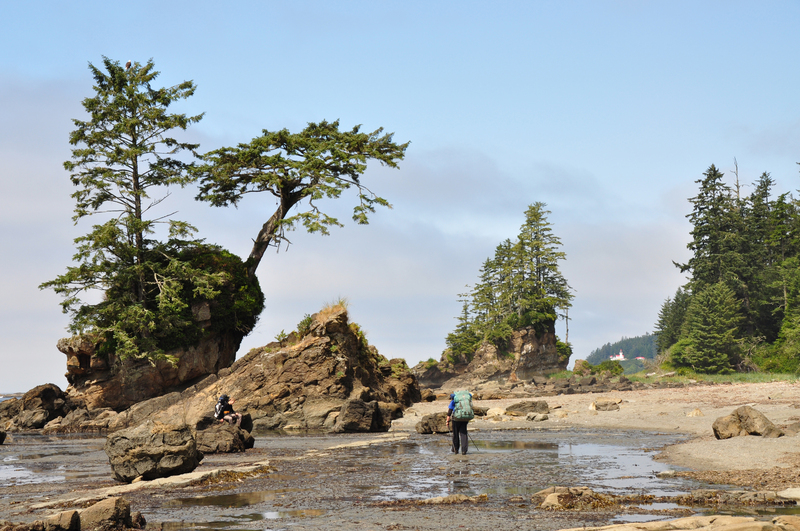 The West Coast Trail offers sandy beaches, rugged cliffs, blowholes, caverns, caves, waterfalls, bogs, rainforest, lighthouses, abandoned settlements, shipwreck relics, native culture, whales, sea lions, eagles, and giant trees. 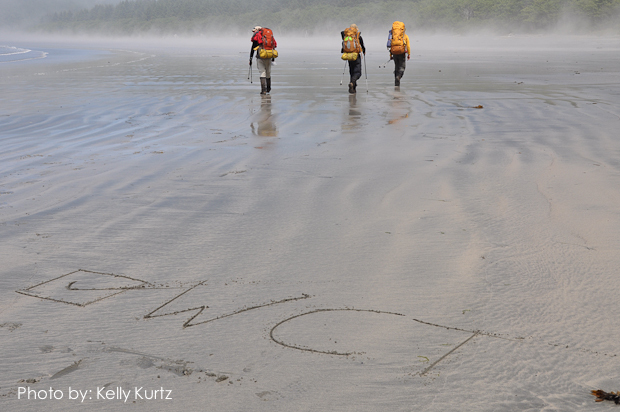 Our West Coast Trail itinerary includes stops to see historic and scenic wonders unknown to many hikers. Our pace allows time to adjust to the demands of the trail and to fully see and explore this magnificent Coastal Environment. Readings and anecdotal stories help the hiker fully appreciate the dramatic and colourful history of the events and people who were a part of this coastline. We have arranged a food drop for the half way point in our hike, thus reducing the weight carried by each hiker during each portion of the hike. A complete itinerary along with maps, clothing and equipment list, will be issued upon registration. Note that itinerary listed is Port Renfrew to Bamfield. Included: Transportation from the point of origin and return, camping fees, food drop, trail ferry fees, cooking gear, camp stoves, tents, meal preparations, meals/snacks/beverages on the expedition, tarps, major first aid supplies, emergency radio or satellite phone, and professional guides. We can provide sleeping bags, sleeping pads, and backpack if required. Meals: All meals while on the backpacking portion of the trip. Day 1: **Pick Up** – We have arranged a private charter pickup from the Accent Inn at 6:30am. You will be driven to the Horseshoe Bay Ferry Terminal for the 8:25am ferry to Nanaimo on Vancouver Island. This is our ONLY pick up spot and time in Vancouver. If you are not staying at the Accent Inn you will either need to taxi to the Accent for 6:30am or make your own way to the Horseshoe Bay ferry terminal for 7:45am at the very latest (generally by taxi). You will be greeted by a Sea to Sky member who will pay for your foot passenger ferry tickets and accompany you to our bus on the other side**. Nanaimo is a good choice if you are looking for less travel time on the first and last day of the trip. Nanaimo acts as the link that “closes the loop” for our trip, it is the perfect pick up and drop off location. Also a good choice if you are planning to stay on Vancouver Island. **Pick UP** – The ferry from the mainland will land around 10am, meaning that your guide team will likely be by your Nanaimo hotel at approx.. 10:30am. We then have approx 1.5-2hr drive into the small community of Port Renfrew. After registering at the trailhead office, we will set up our tents for our stay in Port Renfrew. The time will be used to get to know our traveling companions and discuss the trail ahead. Day 2: We will return to the West Coast Trail registration office and be transported across the Gordon River by boat to the trailhead. Our destination is Thrasher Cove. Although just 6 km away, the terrain is such, that it will take us most of the day. There are no scenic rewards other than those provided by the forest, creeks and occasional waterfall. You will sample your first set of ladders and see a donkey machine.Thrasher Cove presents your first opportunity to enjoy beach camping. 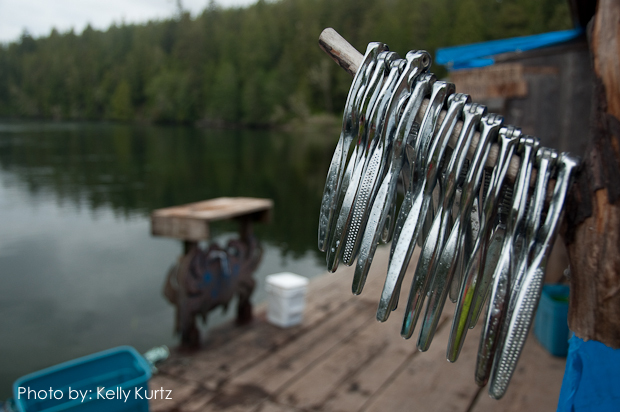 Although a small cove, it provides water and an excellent view of Port San Juan and Port Renfrew across the water. Day 3: The morning tide will determine whether we will follow the beach to Owen Point or return to the trail. The beach hike, although characterized by huge boulders, is easier and shorter than the trail. The shelf near Owen Point has sandstone bluffs, caves and caverns, unusual rock formations and surge channels. Many hikers believe it resembles a moonscape. We will eventually leave the shelf because of impassable headlands and sample the beauty and denseness of a west coast rain forest. Camper Bay is our destination. The campsite is located by a creek and flanked by magnificent sandstone bluffs. Day 4: Our day will once again be spent in rain forest. Although this is a difficult and usually muddy section of the trail, it offers an opportunity to really appreciate the lush, vibrant beauty of a rain forest. Or we may be lucky enough to traverse one more amazing sandstone shelf, tide willing, on our way to Sandstone Creek. 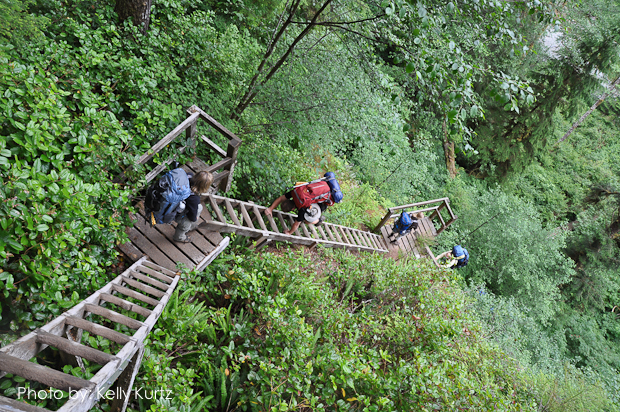 At Sandstone and Cullite Creeks we will encounter another series of ladders. 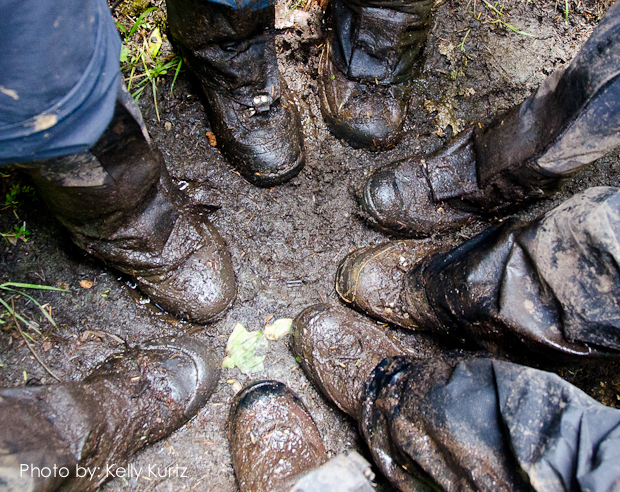 From Cullite Creek we will pass along a boardwalked bog that features some interesting flora, including stunted cousins of hemlock, spruce and cedar. 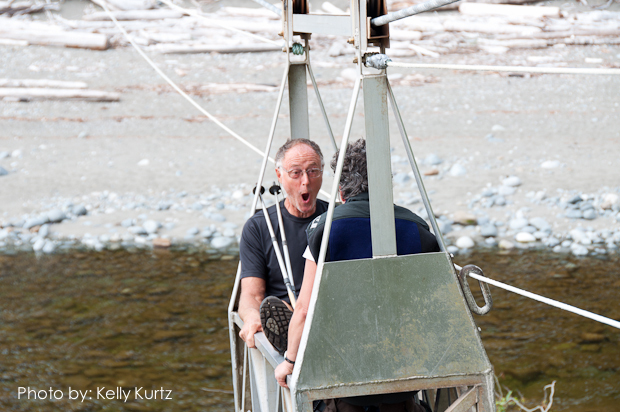 At Logan creek we will cross the WCT’s largest suspension bridge. Our campsite is Walbran Creek. We now leave behind the most difficult section of the trail and begin that section characterized by mostly beach and shelf hiking. Day 5: Today will be a shorter, rest day. Primarily on the beach, this day’s hike will be a welcome change from the challenges of the forest. At Bonilla Point we will see the Carmanah Lighthouse in the distance. Today we will pass a special spot on the beach which was, until recently, the location of Chez Monique’s. Sadly both Monique and her husband, Peter, have passed and the legendary food shack has been forced to close. Your guide will be happy to recall many tales from past visits with Monique who was well-known for her generous and gregarious nature. Her daughter Sandy and her family kept the oasis open one last year in 2018 to honour her parents. 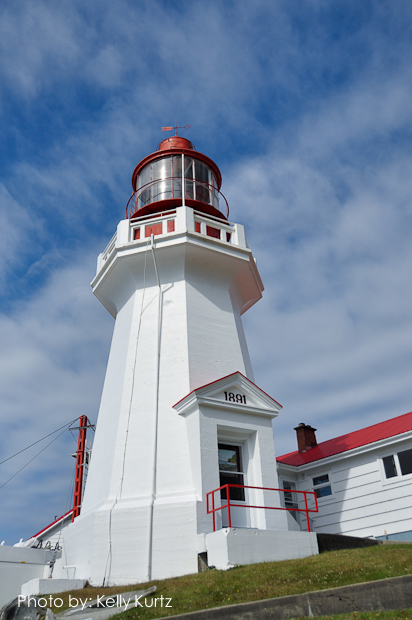 Next we will visit Carmanah Point Lighthouse; perched on top of the cliffs like a castle, Carmanah offers breath-taking views of the surrounding area. Below the lighthouse is a rock favoured by sea lions. Our camp tonight is the Cribs, the Cribs features a natural breakwater with many tide pools to explore. Day 6: Depending on the tide, we will likely hike the “beach” again . This section of hard packed sand, imposing cliffs and some of the most unique and varied sandstone rock shelf formations makes for very enjoyable hiking. We will descend to a beautiful sandy beach near the Cheewhat River. After crossing the Cheewhat River we will re enter the rainforest (where you’ll really notice the difference in the type of trail compared to the first three days) and finally make camp on Stanley Beach. Stanley Beach has some interesting features, including surge channel, abandoned house, blowhole, and honeycombed rocks. Day 7: The trail from Stanley Beach to the Nitinat Narrows is completely boardwalked. The Narrows, because of its depth and current, must be crossed by boat with the assistance of the local First Nations. Carl and his family have been operating the “Crab Shack” here for many years. We will stop here for a hearty breakfast (with the option for other treats from the Sea as well). We will also pick up the remainder of our food for our last part of the trail. 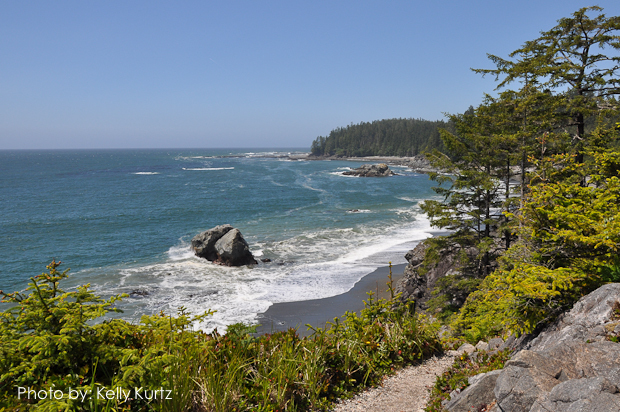 The section of trail from the Narrows to Tsuquadra Beach is considered by many to have the most spectacular views. We will stop to explore the remnants of the Didadaht lodge from the turn of the century. Old lodge poles stand in solemn tribute to the memory of these hardy coastal people who once inhabited the site. Soon after leaving the lodge site we will arrive at Hole‑in‑the‑Wall, a wave worn hole cut into the rock at Tsusiat Point. 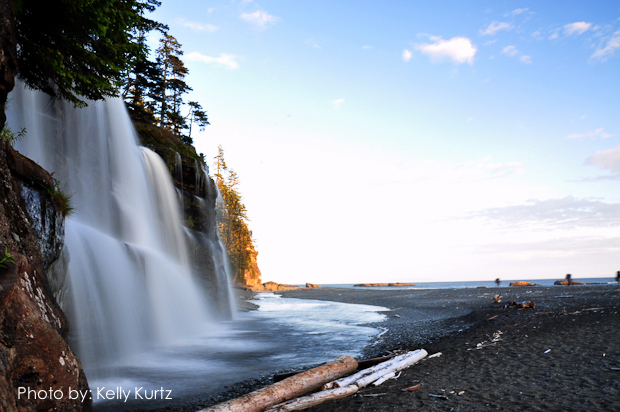 An old Indian legend states that “… those who pass through Hole‑in‑the‑Wall have passed through Hole‑in‑ the‑Wall.” Tsusiat Falls is just up the beach, is our campsite. Tsusiat Falls is considered by many to be one of the major highlights of the trail. Day 8: From Tsusiat Falls we will hike to the Klanawa River and our last cable car crossing. We will follow the beach until Trestle Creek and then head into the forest. We will stop where the trail overlooks the shelf. In 1906 the S.S.Valencia went aground here in a violent storm. The battering waves eventually broke the ship apart and 126 passengers and crew lost their lives. This tragic event was the catalyst for creation of the Life Saving Trail which would later become the West Coast Trail. Returning to the trail we will cross two suspension bridges and our last ladder. We will eventually emerge from the forest at Tsocowis Creek. It is all beach and shelf to our campsite at Michigan Creek. Day 9: With the exception of a visit to Pachena Lighthouse, our last day on the trail will be uneventful. From Michigan Creek the trail will be entirely through rainforest. The route follows an old supply road. It is considered the easiest section of the trail. The end of the trail is at Pachena Bay. We should be there by noon. We will drive to Port Alberni for lunch and then on to the Departure Bay ferry terminal in Nanaimo. We should arrive at the ferry terminal by late afternoon with the intent to catch the 5:55pm ferry back to Horseshoe Bay. A private charter will be waiting to take you back to the Accent Inn where you will likely arrive around 8:30pm.